I'm happy to announce Kelly Tillotson is the winner of the book, The First Christmas Night! (You'll find the review at this link) Thank you Karen for reading grandma's cookie jar (please message me your address by November 25th so I can have it sent to you) and thank you Boxer Books for sending one for me to review and for making another available for me to give away! 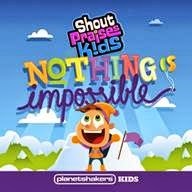 I'm also happy to say, tomorrow I'm giving away a CD and DVD for, Planetshakers Kids Nothing Is Impossible! You'll find all the details at this link, but there is still time to get in on the give-away fun! This would be great for my Sunday School class. I will share, I follow on FB and google account. Thanks for the chance.